The color I received in my box this month was Santa Barbara Surf, an absolutely gorgeous, sea foam green. While not neon, this color is very bright and absolutely perfect for Spring and Summer. I really like the formula on this one, but it does dry quickly, so you need to be pretty precise in your application. If you go over it too much, you’ll start to have streaks. This took two coats for full coverage, but if you have nail ridges it will take three if you don’t use a ridge-filling base coat. This is one of my new all-time favorite creme polishes. The color payoff is outstanding and this is my favorite kind of color. 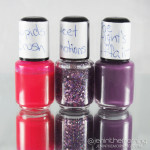 Lauren B Beauty nail polishes are 5-free, cruelty free and vegan. The bottles are generous, 14.8 mL, and retail for $18.00. 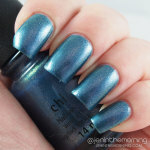 Overall, I am a huge fan of this polish and plan to add more of their polish to my wish list! Stunning shade. I like the dotticure. Gorgeous color and love the art. Very cute! This is a perfect color for summer! This color is gorgeous on you! And your nails always look fabulous! Stunning swatch and polish! Maybe I’ll get over their price tag one day!!! That color is stunning!! I love the addition of the gold dots! This look so simple and cute! I am in love with that shade of teal.